Located in a high balcony on the left (north, Gospel) side of the church and extending out from the enormous choir gallery, this magnificent organ resounds in one of the most imposing visual and acoustical spaces on the American continent, the church of Santo Domingo Yanhuitlán. 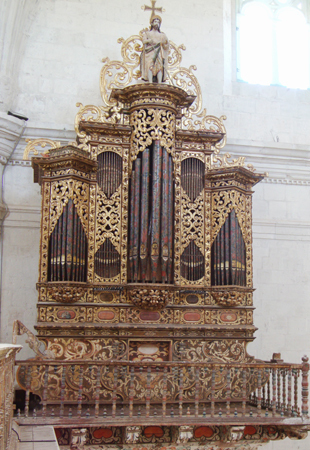 Even though the date of construction of the organ and the name of its builder remain unknown, it can be assumed that the organ was built in Oaxaca around the year 1700, since its case profile, with the characteristic Oaxacan “hips” on the sides, and its sumptuous façade decoration so closely resemble those of the organ located in la Basílica de la Soledad (1686). Most striking are the phantasmagorical designs painted on the front of the case, the richly gilded carvings, and the grotesque faces on the facade pipes. This is the only organ in Oaxaca decorated with Dominican symbols: the black and white cross and the dog carrying a torch. A lovely statue of Saint John the Baptist stands atop the organ. 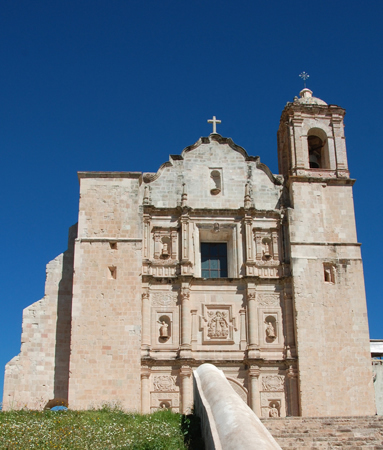 The organ of Yanhuitlán was reconstructed between 1996 and 1998 with the support of Fomento Cultural Banamex A.C. This intervention would be considered a reconstruction rather than a restoration, since many of the pipes and the interior wooden components were badly deteriorated and had to be replaced. The project was directed by the French organbuilder Pascal Quoirin in collaboration with the Academia Mexicana de Música Antigua para Órgano (AMMAO), directed by Gustavo Delgado and Ofelia Gómez). This instrument shows evidence of repairs and other interventions over time by various organ technicians. The restorers inherited an instrument that had been substantially changed during the 19th century (the keyboard is dated 1886). The most damaged pieces were replaced, including the rank of horizontal trumpets, many of the interior pipes, the bellows, the windchest, and various components of the action, with the goal in mind of recovering as far as possible the original character of the organ. Fortunately the original façade pipes with their painted faces and floral decoration could be restored. The background color of the case decoration was originally green, typical of Oaxacan organs of the period, but at some point, perhaps during a misguided fumigation, it turned copper brown, which is the color we see now.